Last week I attended a teaching conference. It was the first one I had attended for some time and it was outstanding. The reason for this is that the options available were not only plentiful and practical but they were also being run by teachers for teachers. It was also a conference that met three criteria for successful professional development, about which I have discussed on this blog in an earlier post. In a recent article on Edutopia, the question was raised: why don’t we differentiate professional development for teachers? After all, we emphasise the need to differentiate what goes on in the classroom. The article, which points out four different strategies to help professional learning be differentiated, caused me to reflect on what happens at my own school and the extent to which we differentiate what happens in our professional learning programs. Firstly, investing in the professional capital of my teachers is a very important. Ensuring that teachers have opportunities for developing their craft contributes to staff longevity on account of staff feeling valued. It also means that teacher capacity is built up so that changes that one might wish to introduce or implement can take place more easily. That is not to say that change is something that will always be accepted or always be perceived as positive. However, if one has invested in the professional capital of teachers and sought to create an environment where teachers expect and are expected to develop their professional learning, change can be considered more amicably. Of course, investing in the professional capital of teachers is something that ultimately benefits student learning, and that is something on which, in all of the discourse about the development of teachers, one must remained focused. So, how do we differentiate in the professional learning that takes place at my school? How might we do a better job of doing that, thereby giving ownership of learning to the teachers themselves? I came across a quote the other day about leadership not being about being in charge but looking after those in your charge. Such a comment emphasises the role that leaders have in making sure that teachers learn and develop. It is, I would hazard, one of the central roles we fulfill. A third question we might therefore pose is: how might leaders facilitate meaningful professional learning? At my own school, professional development is worked into the weekly schedule. Every Wednesday is a “late start” for students; an early start for academic faculty. We meet for 1 1/2 hours to engage in professional development sessions. Sometimes these sessions take the form of a formal lecture, other times they take the form of a workshop or an interactive presentation, and, more recently, they have taken on the form of departmental forums where a broad topic or theme related to the whole school is discussed in a departmental context. These particular discussions have been aimed at incorporating subject peculiarities associated with the topic or theme. As one who is responsible for the professional development or learning of the academic faculty and staff, in addition to the strategic planning, thinking and development of the school’s academic programs, I regularly find myself in an interesting position. On the one hand, I want to grant professional development and learning time as much as I can to those under my wing. On the other hand, I need to incorporate the thoughts, reflections and discussions of academic faculty and staff regarding strategic planning and development. 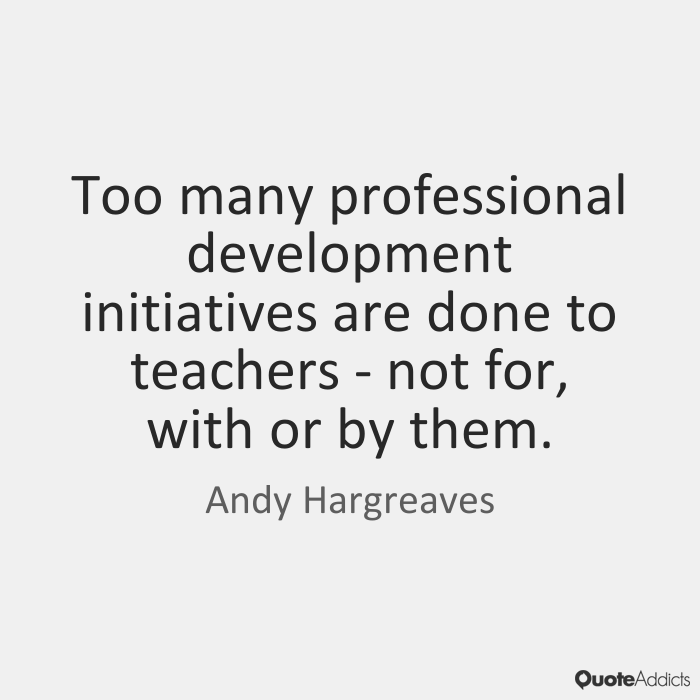 Professional learning often develops into a combination of the two. I don’t think that is necessarily a bad thing. After all, I am keen to encourage a culture where there are ongoing conversations and discussions about teacher best-practice, and that such conversations are not going on in isolation but involve all of a school’s constituents. That is where we are at, at the moment, as a school. Professional learning and development has become a forum where academic faculty and staff can discuss matters pertaining to the school as a whole. It is also a forum where, simultaneously, practical discussions take place about how those matters relate to their own department and subject areas. Recent curriculum work on establishing standards is a good illustration. Key learning areas of the school are examining different standards, determining which best-suit the vision and mission of the school, as well as what they seek to develop within the students that study their subjects. How can this evolution be considered ‘differentiation’? In one sense, it can’t. The question, theme or problem (in our current situation: what standards are best?) has been mandated from the top down. It is the expectation of leadership that departments complete their investigations within the parameters laid down at the start of each session. However, in another sense, there is a great deal of differentiation taking place. The question acts as an anchor point, a central focus question if you like, which tethers conversations to a particular issue at the same time as allowing for the freedom to explore the set topic as freely and as deeply as individuals wish or feel. The Edutopia article poses a very interesting question and one that, at the very least, should cause educational leaders who are responsible for teacher professional learning and development (and as leaders we all should be!) to pause and reflect on how their school professional learning and development takes place. The question about differentiation ensures that any professional learning and development that does take place is meaningful and challenging. It is relevant and applicable. Most of all, it means that it won’t be considered a waste of time, energy and money. Next Next: Is your school perfectly prepared for a world that no longer exists? Dreaming big. Thinking big. What might you do? Are school leaders ever thanked?